Is there anything really new? Lee Mingwei has created an interactive art installation at the Brooklyn Museum. 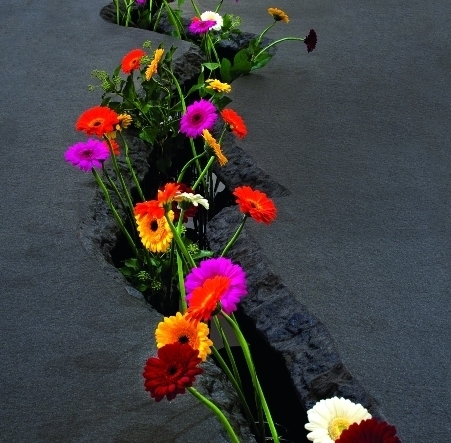 The work features a crevice filled with flowers that runs through a slab of granite. Visitors to the museum may take a flower on their way out of the museum on the condition that they give the flower to a stranger. In the 16th century, Cardinal Giovanni Francesco Gambara created the Villa Lante. One of the great gardens of Italy, the Villa Lante features a stone picnic table with a water rill. 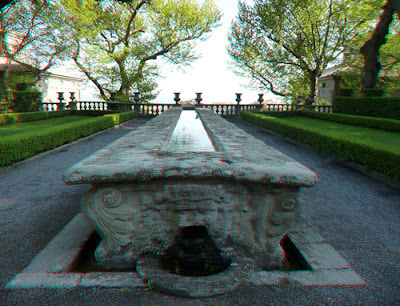 According to legend, the Cardinal kept his wine cool in this floating rill. Unlike Lee Mingwei, the Cardinal's largesse was confined to his inner circle. A couple of years ago, I wrote about Bella Meyer, owner of fleursBELLA in New York City. Bella regularly invites people into her shop to make small bouquets (called Flower Graffiti) and then leads the group around the Greenwich Village dropping bouquets on doorsteps, lampposts or just giving them to passing strangers. Her reason, "Everyone should be able to enjoy beauty." No matter what the origins of Lee Mingwei's piece, I am grateful for the opportunity to give anyone a flower, whether I know them or not. And since there is no such thing as a free ride, especially in the digital age, visitors are encouraged to share their experiences on twitter. on the Brooklyn Museum website and the in-gallery kiosk. "I could go for a new pair of shoes." Talk to Me And apparently you can! Just Press Pause: Are You With Me?